This section mainly explains what an observer would likely see if they were placed in the vicinity of Alpha Centauri. Although quite hypothetical, it gives the reader a good perspective of the nature of the Alpha Centauri system when compared to our own Solar System. Presently, we do not know if an planets orbit around these stars, even though extrasolar planets have been found around several double stars and many solitary stars. If planets were actually discovered here, this might lead to some real impetus in sending some small interstellar space probe. Such a journey would taken many decades to reach the system. In truth, the possibility of humans ever doing such a journey is unlikely to be achieved for many centuries. So from all the previous detailed information given in the earlier parts here, we can now broadly paint the general picture of the nature of this system. Dominating the daylight hours would be this primary G2 star, whose size would be about 1.61 million kilometres across and subtending 42 arcmin in its apparent diameter. This is visually only 10 arcmin larger than our Sun. Any naked-eye observations would likely just perceive the small 2.3% luminosity difference, perhaps being similar to the slight dullness observed during 60%-70% partial solar eclipses. Average apparent magnitude of α Cen A would be about −27.5 or just one magnitude brighter than our Sun. Orbital distances would vary somewhere between 11.42 AU, just larger than the orbit of Saturn, and 34.95 AU; being 1.71 billion and 5.23 billion kilometres, respectively. At the present distance, 1 arcsec is very approximately 1.36 AU in size. At stellar opposition, night as we know it would disappear, leaving one very bright coppery-orange star and similarly coloured illumination on the ground, landscape, and local vistas. The naked-eye would perhaps be able to see stars down to about 2.0v to 2.5v in apparent magnitude. For about 25°, the surrounding corona of α Cen B would cause some difficulty for serious observation, mainly due to the atmospheric scattering of light. Observed colourations would come mostly from the K2 spectral type with the surface temperature of 4800K — some 900K cooler than our the Sun. At each stellar inferior conjunction, α Cen B would be some 56° in declination above the primary. • Duolight with the both stars never setting. • Daylight the primary being circumpolar while the secondary lies below the horizon. • Daynight with the primary above the horizon and the secondary below the horizon. • Twinight the secondary being circumpolar while primary lies below the horizon. • Alnight both stars never rising above the horizon. In the night sky, Proxima Centauri would shine as a faint red star just about 5.1v magnitude or so, and just being above naked-eye visibility. It would only be visible to the naked-eye during the rare times when both bright stars were below the horizon. Detection of the association with Proxima and the main double system would require telescopic observations, specifically from the observed proper motions. This would be in the order of 4.6 arcmin per year and would be too obvious for some keen alien astronomer. Conversely, when looking from Proxima Centauri, Alpha Centauri would appear as an absolutely stunningly brilliant pair in the night sky. The duo would be visible to the naked-eye, though its glare undoubtedly would hurt the eyes. At the true distance of about 0.205 light-years, 13,000 AU or 1.9×1012 km. Visual brightness of both α Cen A and α Cen B would be -6.3v and -4.9v based solely on the respective absolute magnitudes of +4.7 and +6.1. In some references, like the one have used in Table 1-1, finds the absolute magnitudes as +4.38 and +5.74, which would make the visual magnitudes marginally brighter as -6.6v and -5.2v. Regardless, this is of course much brighter than Venus as seen from Earth at its best. Much of this is clear cut, but as for the problems of the eccentricity of the orbit of Proxima Centauri, we presently know very little. If the orbit was near circular then little would change except for the apparent separation of α A and B. If the orbit was eccentric, then the visual magnitude of these main stars would vary. From Proxima the observer would see at maximum distance between the stars would be around 7.4′ or 450″ apart, but this could, at times, range down to several tens of seconds of arc.) Describing this in useful terms is not straight forward. The apparent positions would change over the eighty year orbit, and this must be combined with Proxima’ own place in the 100,000 year period around the main pair. At the moment, Proxima lies in the sky 1.9° away along the position angle 229° (2000). This almost matches today’s (2005) position angle of about 220° from α A and B of today, so that both stars would appear nearly along the same line of sight. I have placed in Figure 5-1 to show the brightness of the main pair as seen from Proxima itself, with the separation of 7.4 ′, as given above. I estimate this will occur somewhere between 2015 AD and 2020 AD. 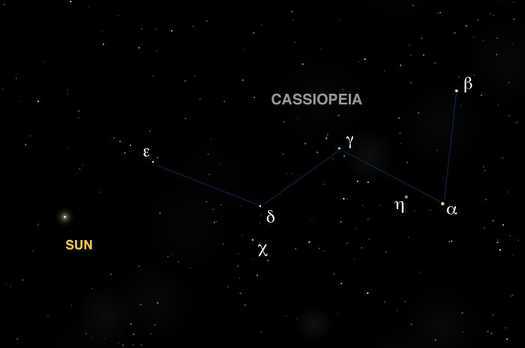 Our Sun would appear as a +0.12v magnitude star in the southern part of the northern constellation of Cassiopeia, being the fifth or sixth brightest star. All visible stars that surround us in space would look the same as from Earth, except perhaps the nearby Sirius, Procyon and Altair, which would have slightly different magnitudes and positions. As regarding the stability of the orbits, it seems to me that he just brushes off the significant problems of perturbations. Another minor hole in his speculations is the problem of how planets could form in such extraordinarily harsh circumstances, as the formation of stellar disks would be significantly destroyed by the gravitation of each star. The main objections to planetary formation would also be based on angular momentum. Formation of binaries, for example, is far more efficient in reducing the problem of wasting angular momentum during formation than making solitary stars like the Sun. A binary stores some 107 times more gravitational energy than the Sun, suggesting that the larger this value, the larger the mean particle velocities during formation. This translates into either mass loss into interstellar space or disruption of the planetary formation process. Evidence of this is the number of stars that have circumstellar disks — none are visual binaries. Another result of these effects would be regarding the influence of comets on the evolution of life. A binary would be very disruptive on the stability of the local anastellar Oort cloud, causing the cometary material to be rapidly eradicated. In the Alpha Centauri system, for me Proxima influence would literally vacuum clean and quickly destroy this cloud! Although the current ‘flavour of the month’ seems to show that comets and asteroids are quite ‘dangerous’ objects for us fragile human beings. Perversely, they might have had some significant influence on why we have been put here in the first place! Although comets crashing into the Earth may cause absolute havoc for life and signify mass extinctions, they act as significant stimuli for driving evolution to ever more complex life-forms. Some, like Fred Hoyle (1915-2001), have speculated that comets may have brought life to the Earth, or at the very least, introduced the necessary materials of life — amino acids, but mostly water that formed the Earth’s oceans, etc. 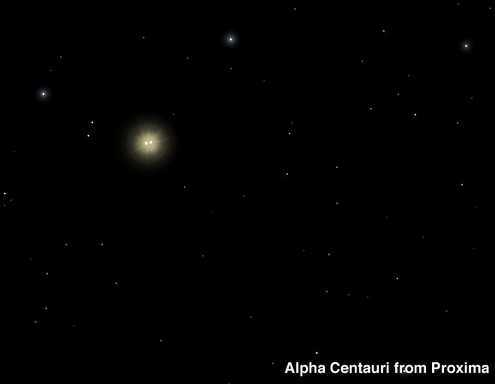 For our hypothetical Alpha Centauri planet, such problems may mean that life is far less likely. Development of life (Rigel Kentaurians?) may be limited in binary star planetary scenarios. If life forms do exist, their exobiology would likely be quite different from Homo Sapiens. I.e. They would not have our natural life cycles that follow day and fight. The species would be far more robust than the frail creatures of the Earth ’ views strongly developed in films like the sci-fi classic “Alien”. Much of the problems with these observations is with interpreting the data with spectroscopic or more indirect methods like radial velocities. This is true, especially with the latter, as they are far more subjective in binary systems because of the necessary quality of the observations. There is also some evidence that the red dwarf in γ Cephei might have been captured and not formed with the primary. Another important system was Iota (ι) Horologii, but this also has also since been retracted. The difficulties with binaries is that there are other factors when detecting the behaviour of exoplanets around stars that cannot be explained without also eliminating the effects of the companion star(s). However, the existence of planets around binary star system are an interesting problem. No doubt in time this might be proven to be true, but at the moment confirmation of exoplanetary still is in early days. At present, fifteen double or binary stars are suspected to have planets, but all suffer from the problems eliminating the effects of companions stars. A few reports and current investigation being undertaken at the moment, but few have shown absolutely that these exoplanets exist. The most interesting aspect in the last year is the discovery of dust rings surrounding some binary systems, which are unexpected — yet till now no planets have been yet confirmed within the large dust disks. Current investigations using the European Space Agency’s ground-based Darwin Telescope are soon to be made to look towards Alpha Centauri, which is probably the best binary to look for the possibility of detecting Earth-like planets simply because of its proximity to our Sun.